In 2009, Charlie and I went to a family reunion in Jonesboro, Arkansas. We stayed with a good friend of mine (who also lives in Jonesboro), who does some singing with Charlie at the Canton Flea Market “First Monday” each month. They asked Charlie to bring his guitar so they could do some jamming. 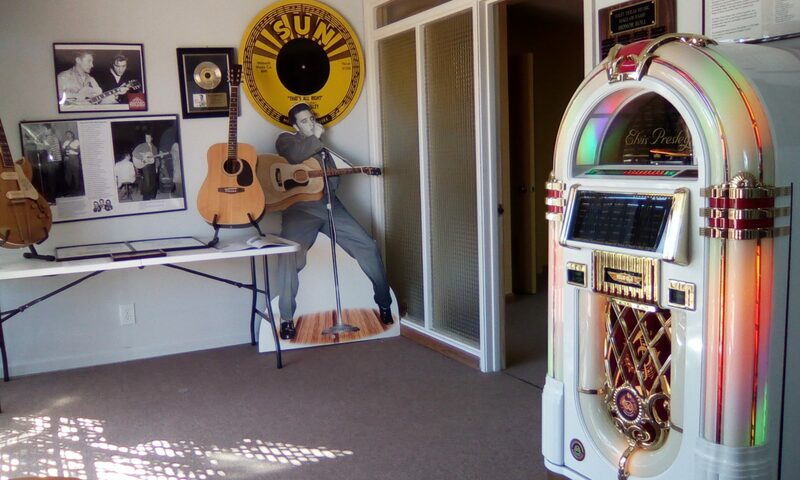 One of the side trips we made was to Elvis’ Graceland in Memphis. The first thing that struck us about Memphis was the size of the Mississippi River as we crossed the bridge coming into town. It looked more like an ocean than a river. As we drove downtown Memphis, to the corner of Marshall and Sam Phillips Ave, Charlie saw something that caused him to yell out loud–“Sun Records”. There on the right was a extra large guitar hanging from a sign. On the windows of the building it said “Sun Records”. Charlie said” we’ve got to stop!”. We did and what a thrill! This was where it all started for Elvis, Jerry Lee, Johnny Cash, Roy Orbison and a bunch of other big Rock & Roll entertainers. There were pictures and vinyl records by the original artists covering the walls. Most were autographed. Charlie felt he was on “hollowed ground”. We left with some advertising along with some Sun guitar picks…a great start to a big memory. But the biggest memory will always be Graceland. Charlie was especially taken by the original 1955 pink Caddy. He remembers when Elvis drove it to San Angelo in 1955 for his appearance at the City Auditorium, where he sat on the hood and watched Elvis sign autographs for all the “frenzy & crazed” girls. I think this was when all us were teenagers, including Charlie, became indoctrinated into Rock & Roll music. What an entertainer! There will never be another one like ELVIS.